I really miss these things.. The neighborhood kids…and me..and their dog..
I’ve been thinking about this a lot lately…I miss so many things from my child hood. Does everyone get to this point as they grow older or is it just me and the fact I have so little left from my childhood it makes me melancholy? Or is it summer? I loved summer when I was growing up. 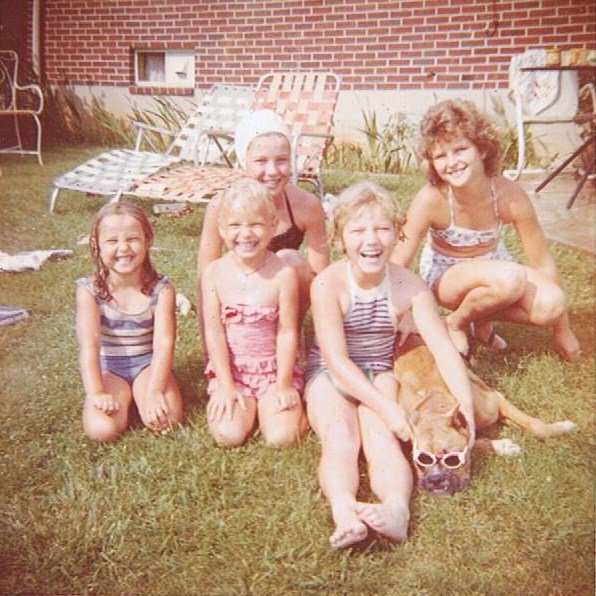 All the neighborhood kids would gather at our house…we had a pool. Not a big pool, but we were the only ones with a pool, so everyone came to our house. I miss so many things from the past and they keep seeping into the corners of my mind. Here are a few of the things I miss. I miss when people were nice to each other. I miss when you walked down the street and people said hi to you. They didn’t look at you like you were crazy or act like they might hit you or even worse, totally ignore you. And I live in a small town. I miss shopping downtown. Every Friday night we went downtown to shop. The sidewalks and stores were packed with people and even if we didn’t buy anything we had a wonderful time. I especially loved the 5 &10. And eating grilled cheese and fries at the snack bar..and a coke of course….a fountain coke. I miss family dinners when everyone ate at the same time and we talked about our day. No one had an electronic device or a phone… we actually communicated with each other over our delicious home made meal. I miss going to bed at night with my transistor radio pressed to my ear… Listening to great stations with a real live person talking. Wonderful music was playing and I knew the word to every song and knew the name of the person or group singing the song. I miss when you knew all of your neighbors and they would help each other and watch out for each others kids. They would yell at you if you did something wrong and the parent of the child didn’t get mad at them, they would actually be glad they did it. I miss not having a care in the world…knowing my parents were taking care of everything and I didn’t have to pay bills or get the roof fixed if it leaked. I miss my parents always being there if I needed them. I miss the simplicity of the world back when I was growing up. Yes, there were problems back then too, but we didn’t stop talking to our family members or friends if they felt differently about something then we did. We had respect for each others thoughts and feelings. I miss the closeness of family. I miss going to my grandparents house every Sunday night and the whole family would be there. All my aunts, uncles and cousins…we all lived in the same town and we saw each other every week. I miss sleeping in the same room with my sister and telling her all kinds of stories and maybe even scaring her…just a little. I miss the absolute trust she had in me. No one has ever had that same trust in me that she had. I miss the warm days of summer when I as grown woman would set up the small pool in my own back yard and my children would run through the sprinkler with their friends. The sound of their laughter echoing through the neighborhood. I can still smell the Coppertone and grilled hot dogs and it weighs heavy in my heart. Times change, we change, we grow older, people move away and sadly we lose people. We took things for granted when we were young and thought they would aways remain the same. We were innocent and we were a little bit stupid. I wish I would have known then how much things would change. I would have done so many things differently and would have told people how much I cherished them while they were still here. So my advice is this…Live life fully, Love deeply, and enjoy each and every moment with family and friends. Most of all..be kind! Thanks Bev, love you too! my home to the “delicatessen” where a piece of candy might make the day even better. And I was always with one of my friends who lived just houses or Chicago blocks away. The best was encountering a thunder storm on our way back and getting wet and running in the rain. As they say, thanks for the memories. Thank you Beth! I enjoyed hearing you memories too! There is a wistful quality to recalling details from my childhood. It’s bittersweet. Thank you for the details. It helps jog my memory for specifics from my life–some that are from the broader culture in the US, some that are specific to my family. Love the photo! I love that final quote. Memories remind us of who we are and why we are here even in the tough times. Thank you for always being the voice to remind us to cherish life right now and to love friends and family freely. I know that much of this wisdom came from pain and I am so very sorry. I think that the things you miss are experiences shared by most of our generation. It was a kinder, gentler time. It was indeed, Thanks Cheri! Very good post. Yes, we all look back upon days of our youth with unvarnished nostalgia. The food tasted great at Grandma’s house even though it would never pass the guidelines of the food police today. We played with wild abandon with our friends never fearing what dangers lurked close by. My greatest fear was getting home too late and incurring the wrath of my dad. People were kinder, I believe, because they had less distractions in their lives and being polite was a rule that was drilled in our heads at an early age. We made up our own games with objects found in our yards and homes and our imaginations were unlimited. The times have changed and those days of innocence are gone. However, being kind and enjoying the simple things in life will never leave us and it makes us all happier and better people. Thank you Andy and as usual your comments are spot on! Yes, yes, yes, Renee. Everything you wrote is spot on. We all ran wild back then…..now parents are afraid to let the kids do that cause of all the crazy weirdos out there. So sad. yep,gotta agree on everythjng you stated. We didnt have MUCH but we did have Fun. So true Susie, so true! Love that photo! While raising my 3 children, I tried to recreate the wonderful carefree summers I enjoyed as a child. I did my best but it was hard when most of their friends were away all day at camp. Even when the kids were home they liked to play Nintendo inside. We had a big pool, so that helped a bit. Still, it was never the same. I remember all the moms sitting around in lawn chairs while kids played tag and ran through sprinklers. Summer is still fun for kids but not carefree. Lots of structure, stimulation, travel, screens, and more time indoors. “Does anyone really realize life while they live it…every, every minute?” Our Town, Thorton Wilder.